Infinitely scalable EPS vector files and JPG, PNG, and TIF files in two pixel sizes: 1200 px and 600 px. A PDF contact sheet showing all the designs with their names is also included. A hand crafted suite of graphics for worship folders, screen graphics, and assorted print materials. Symbols 2 features 21 unique designs that represent the holy apostles and four evangelists. Both black and white versions of each design give you even more choices. 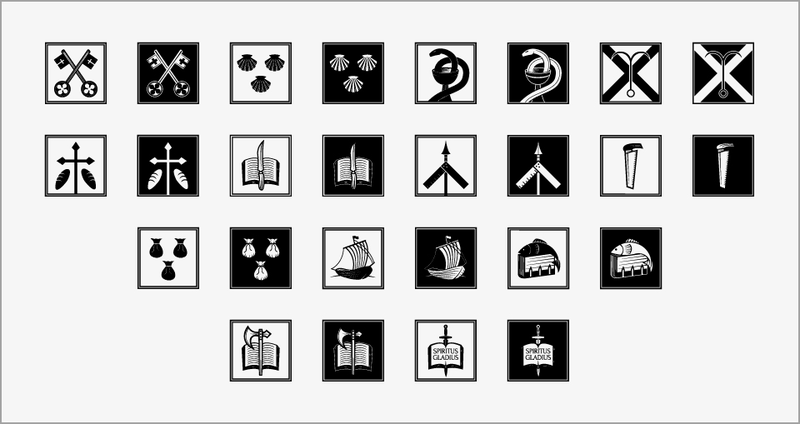 Symbols of the twelve apostles and St. Paul in both black and white versions. Four variations of the evangelists Matthew, Mark, Luke, and John.